US, 1988, 126 minutes, Colour. John Neville, Eric Idle, Sarah Polley, Oliver Reed, Valentina Cortese, Uman Thurman, Robin Williams, Jonathan Pryce, Bill Forsythe, Alison Steadman. 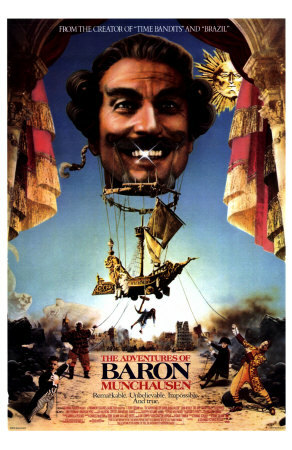 The Adventures of Baron Munchausen is an extravagant and enjoyable imaginative folly. It is the work of Terry Gilliam, the American member of the Monty Python group, responsible for so much of its extraordinary imaginative animation. Gilliam also directed such films as Jabberwocky, Time Bandits and Brazil. The Baron Munchausen film is considered to make a trilogy with Time Bandits and Brazil (from exploring the present and the future to exploring the past). The film was co-written by Terry Gilliam and Charles Mc Ewan, who has a featured role in the film. However, the imagination is Gilliams. Taking the adventures of the 18th century baron, fantastic adventures of a man who was considered unable to lie and yet tell fantastic stories. It is an opportunity to explore the role of reason and imagination. The age of reason is ridiculed - having wars run according to rules irrespective of loss of life. The contrast is the imagination where anything is possible. The cast is led by John Neville as the baron and there is an odd assortment of British stars including Python star Eric Idle, Bill Patterson, a guest role momentarily by Sting. Valentina Cortese appears as the Moon Queen and an uncredited (except under the name 'Ray D. Tutto',(Italian for 'King of All') is Robin Williams as the Moon King. He is almost too much for the film and the film pauses for his tour de force comedy. Also appearing in an unusual sequence as Vulcan is Oliver Reed. 1. The impact of the film? Imagination, visuals? Meanings? 2. The work of Terry Gilliam and his imagination: contribution to Python humour, Python animation, imagination? His film canon? 3. The traditions of fantasy: imagination, what if ... ? Possibilities and impossibilities? The visuals, the sets,	the costumes. The different ages represented? The moon and the galaxies? Special effects: the city, the siege, the theatre and performance, the palace of the sultan, the baron and his horse, on the cannonballs, the world of his servants and their special abilities, the balloon, space, the moon, the role of Vulcan and the volcanoes, dancing in the air, the card game, the sea monster, the final siege? 4. Tales of Baron Munchausen: the traditions, wonderful adventures, the truth, lies, confidence tricks? 5. The setting of the 18th century, the age of reason, Wednesday and its rules? Mr Horatio Jackson as a public servant, controlling the conduct of the war, the days on which siege and attack, surrender were possible? Killing the officer played by Sting for being too successful, the deals with the sultan? Controlling the play and morale? The Turks and the siege? 6. Henry Salt and his entourage, and son - and daughter, Sally? The performance of the play, the sailing, the moon, the sea monster and the snuff? The effects going wrong? The members of the cast, the response of the audience, Jackson and Co. watching? The arrival of the baron and his interruption, his flying on the cannonball and back? Recognising members of the cast as his servants? Going on, his performance and the audience response, the reason for the siege? the sultan and the bottle of wine, the servant with the great speed, sleeping under the tree, the baron about to be executed, the sultan and the performance of his opera, The Torturer's Apprentice - and the humour of operas about the Middle East? The baron winning, the strong man taking all the treasure? The sultan pursuing him? 7. The siege and the people’s: need for help? The baron offering to help, taking the servants from the character62 Charmed by the ladies? Making the balloon from their underwear, the ship, sailing in the nick of time,. throwing the bag out but saving Sally, the boat and space? 8. Going to the moon, the theory about the King of the Moon and the Queen? The King of Everything? The delusions of intellectual grandeur? The philosophy and metaphysics of the king and his head? The contrast when combined with the body and his passion and lust? The queen and her separated head, with her body? The queen helping the baron and Sally while the king thought he had her in bed? The attack on the baron, prison? The discovery of the servant who was imprisoned on the moon for 20 years, his lapses of memory, his escaping with them? Robin Williams and Valentina Cortese and their tour de force for the mad comic philosophy and patter of the king and queen? 9. The volcanoes, Vulcan as the barbaric god, trying to be nice with etiquette and good manners? The servant reformed and being dainty? Venus arising from the shell, the baron entranced by her beauty, dancing in the air? The jealousy of Vulcan? The exasperation of Sally? The irony of Vulcan with the model of the nuclear warhead and his explanation of nuclear war? 10. Discovering Gustavus and Adolfus at the card game, their age and infirmity, the baron wanting to die? Sally urging them on? The rope through space, the sda, being swallowed by the monster, resigned to their fate inside? The baron with his snuff and their being freed? 11. The baron and his ideals, heroics, an age of reason Don Quixote, Sally as his wise Sancho Panza and urging him on? The ever-presence of death and the skeletal presence in space? Thwarting death? 12. The siege, the wounding of the baron, the doctor arriving, the doctor as death? 13. The siege, Jackson and his rules? The exploits of the baron and his group? Each with their own skills - with speed, with blowing, with accurate aim, with strength? The humorous massacre of the sultan's troops, the attack on the sultan? The victory and yet the baron killed? Jackson firing the shot, Jackson as death? The funeral and the grief? 14. The sketch of Sally, urgency, help, belief in the baron? 15. The contrast with Jackson and reason, cruelty and death? 16. The sketch of their servants, their characters and comedy, the irony of their skills? 17. The true ending, the baron on stage once again, moving from his funeral, urging the people to go to the walls, peace and the enemy all disappeared? 18. A flight of fancy and fantasy, the past and the age of reason, the 20th century as an age of reason which needs imagination? The baron as the quixotic hero? 20th century people needing to be saved by such heroes?